You may have driven on Summit Boulevard, just west of Military Trail, and seen the Summit Pines development. Another nicely manicured collection of homes and condominiums. But it has a secret. It was once a grand estate which probably had no equal in Palm Beach county – a gentleman’s country home, complete with flower gardens, a dairy and greenhouses with exotic plants. You probably have never heard of Hugh Dillman. He was born in 1885 in Ohio under the name Hugh Dillman McGaughey, and made his way to the Broadway stage. 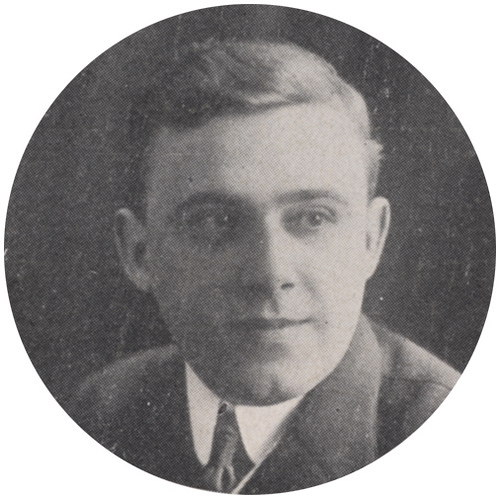 He also had a brief silent movie film career, making a few movies such as “Am Amateur Widow.” He left his acting career to join the Navy in 1917 and served in World War I. In 1919, he married a very popular actress of the time, Marjorie Rambeau. The marriage did not last and the couple were divorced in 1923. Friends had told him of Palm Beach and the opportunities it offered, with the land boom just gearing up. He came to Palm Beach and began to sell real estate and was one of the founding members of the Society of Arts (later renamed the Society of the Four Arts) and served as its first chairman. Mr. Dillman was also interested in music, and had arranged a tour for a group of young African-American singers throughout Europe. It was on that tour that he met Anna Thompson Dodge, the middle-aged widow of Horace Elgin Dodge, the car magnate. Anna Dodge was reportedly the richest woman in the world at that time, having lost her husband fairly early in life. Dodge was very taken with Mr. Dillman and asked him to find her a house in Palm Beach. He was her sales agent on the largest house in Palm Beach, Addison Mizner’s Palm Beach masterpiece, Playa Riente (“Laughing Beach”). Dodge bought Playa Riente in 1926 from Joshua Cosden, a wealthy Oklahoma oilman who had lost his fortune in horse racing. Dillman and Dodge were married May 8, 1926 in her Michigan mansion, with Dillman being fourteen years her junior. While on one of their many trips around the world, Dillman decided he wanted his own country farm. Dillman was raised on a farm, and believed that small family farms were a way that the common man could support a family. in 1931, he cabled a friend while in Calcutta, India to purchase land for him in Palm Beach County. He returned in the fall to find his land under ankle-deep water! He purchased adjacent land tracts so that the farm was about 400 acres and drained the land. He named the estate “Sandy Loam Farm” and wanted to create an experimental agricultural farm to see what kinds of produce and plants could be grown in South Florida. He built a very large log cabin-style lodge that was expanded with additional quarters in the 1930s. visible in the adjacent photograph. During the Great Depression, Dillman raised thousands of chickens that were sold for 25 cents, or donated to the Salvation Army. Sandy Loam also had a working dairy with Jersey cows and Black Angus beef cattle. Dillman was truly at the center of Palm Beach society. 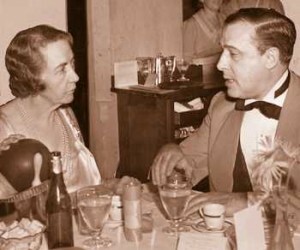 He served as president of the exclusive Everglades Club from 1936 to 1951, and saved the club from bankruptcy with his “Victory Dinner” where over $600,000 was raised. It is believed to be the biggest event ever held at the club and featured the Ziegfeld Follies. Mr. Dillman was also very active in fund-raising during World War II, hosting many events to help soldiers and refugees in Europe. He also was instrumental in fund raising for Good Samaritan Hospital, and the Hugh Dillman Pavilion was named in his honor. In 1943, Dillman sold the Sandy Loam Farm to to three couples. Apparently the commute from Sandy Loam to the Everglades Club was too far during WWII, so he took an apartment at the Everglades Club. This also was an indication that his marriage to Anna Dodge was in trouble. She filed for divorce in March 1947, citing the fact that they had not lived together for seven years. Sandy Loam was sold again in 1946, this time to S.R. Famel, for $125,000. The Famels turned Sandy Loam into a commercial nursery specializing in flowers and all kinds of tropical plants. Ads from the 1950s give the address as “Dillman Road”. The road was eventually renamed Summit Boulevard to where Summit terminates at Jog Road. There, Dillman Road does carry west to Okeeheelee Park and then west past the turnpike. The Famels owned Sandy Loam Farm until the 1980s. In March of 1984, an estate sale was held and the fixtures and contents of Sandy Loam Farm and the lodge were sold at auction, and the buildings torn down. Sadly, I was not able to locate a picture of the log home. Could anything from that time have survived? I looked at aerial photos from today and 1968, and knew that the lodge stood exactly where the clubhouse and tennis courts in the Summit Pines development are today. As I rounded the bend, I saw it. A survivor. 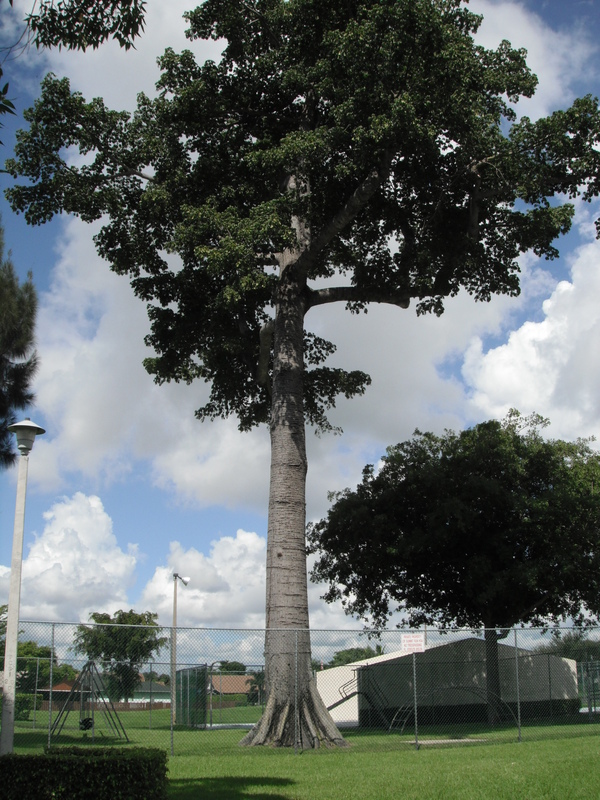 A beautiful 75 foot-tall kapok tree! A resident was retrieving mail at the clubhouse, and indicated that there were once three kapok trees, but two had been lost during the 2004/2005 hurricanes. I spoke with a man who has worked on the property for 18 years, and he had no idea about the history, but had wondered about the large tree. He also pointed out the row of Royal Palms lining the lake. He said every year people come and collect the seeds as they are a smaller, more elegant variety than the common Royal Palm. By looking at pictures of different types of Royal Palms, I think they might be Puerto Rican Royal Palms. My research revealed that Gene Joyner, the retired county horticulturist, worked on the Sandy Loam Farm during college, so I will follow-up with him to see if I can find a photograph of the log cabin lodge. This story was researched through the Palm Beach Post Historic Archives and the New York Times Archives. The Myth of Knollwood Groves – BUSTED! 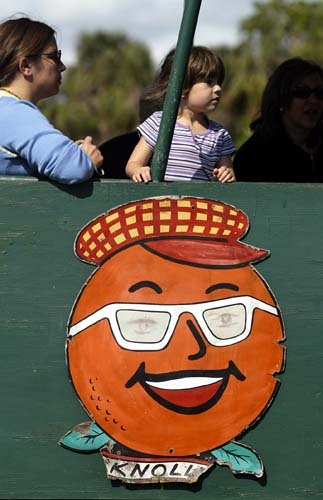 Knollwood Groves, which was located on Lawrence Road in Boynton for over 75 years, was the last of the old-time Florida attractions in Palm Beach County. I went there often as a child, and was lucky enough later to live adjacent to the groves during its last years of existence. If you never visited the place, it was a true classic Florida-style attraction – a gift shop, free orange samples, an alligator wrestling show, fruit shipping, and a wagon train ride through the groves and hammock. Which brings us to the myth. When you took the wagon train ride, the story of the founders of Knollwood Groves was told, that the groves were founded in 1930 by the actors who played the “Amos and Andy” characters on radio, Charles Correll and Freeman Gosden. In the few articles still on the web about Knollwood Groves, there is always reference to the Amos and Andy founding tale. I wanted to find out more about this tale, as it must have been big news at the time, that the most famous comedy team in the nation was going into the citrus business in Palm Beach County. So I researched the historic archives of the Palm Beach Post. Nothing about this was ever mentioned, which I found very strange. 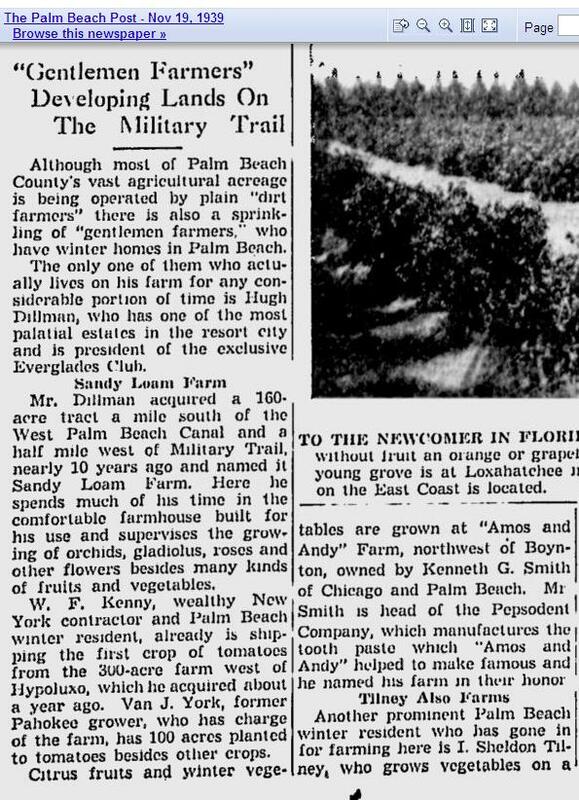 I then did a general search on farms in Boynton, and came across an interesting article (see below) and the myth began to unravel. The article mentioned that there was a farm in Boynton owned by Kenneth G. Smith, president of the Pepsodent Toothpaste Company (his father Douglas had invented the formula for Pepsodent). Pepsodent sponsored the Amos and Andy radio show, and Smith named his farm the “Amos and Andy farm” in their honor – could this be Knollwood Groves? The article only mentioned that the farm was located in northwest Boynton. The only way to answer the question was to search the official records of Palm Beach County. I started online at the Clerk of Court website, but saw that records online are only available back to 1968. I did learn the legal description of the land, which is the holy grail in a land search – the section, township and range. Off to the courthouse I went and found the original handwritten registry books where all transactions were recorded. I was actually surprised that I was allowed to handle these original records. Each book weighed about 20 pounds. The original deed to the land was awarded to the Florida East Coast Railway company, so as I had written in an earlier post, this is land that Flagler got for free for building the railroad. The company sold the land to many individuals, and eventually Frederic Foster Carey and his wife Madeliene bought the land. Mr. Carey was a wealthy stock broker and the Careys had a mansion in Palm Beach (“Villa Vinca”). The sheer number of land transactions recorded in the 1920s land boom was staggering; the land was sometimes changing hands several times a year. But by 1930, the bust was in full swing. The Careys formed a corporation in 1930 called Papaya Groves, then changed that to Tranquillity Farms and the land was held in corporate name. A warranty deed sold the property to Smith May 4, 1933, the day before Mr. Carey died (probably some sort of inheritance move). Smith either sold the farm in 1945 to Knollwood Groves, Inc., or moved the property from his name to the corporate name. In 1937, sponsorship of the Amos ‘n Andy show moved from Pepsodent to Campbell Soup, so he would have to rename the farm. It is possible that he called it “Knollwood” for the famous golf course north of Chicago, his home town. I can understand how the story got a little twisted and people thought the Amos and Andy characters founded the groves. As time went by and Knollwood Groves changed hands many times, it was down to about 35 acres. The hurricanes in 2004 were the final blow, as the fruit trees and buildings were badly damaged. The land was sold to DR Horten for a housing development. Sadly, the beautiful hammock was not preserved and was bulldozed to make way for the houses. The development is known simply as Knollwood, and I doubt many of the residents know anything of the long and storied history of the land. The track of land adjacent to Knollwood (where the Lawrence Oaks and Fox Hollow developments are located) was also owned by the Florida East Coast Railway. The first purchaser was M.A. Lyman (the Lymans founded Lantana) and the deed was recorded September 1, 1910, almost exactly 100 years ago to the day! The price paid for almost the entire section – $500. 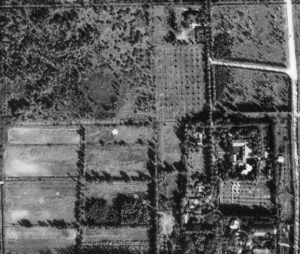 The Lyman corporation sold tracts of land until it was dissolved in 1942. Doing this kind of land search was actually much easier than I imagined. All you need to do this kind of search on your land is the section/township/range of your property (click here for a map) and a few hours at the Palm Beach County Courthouse, 4th. Floor. The staff there were very helpful. 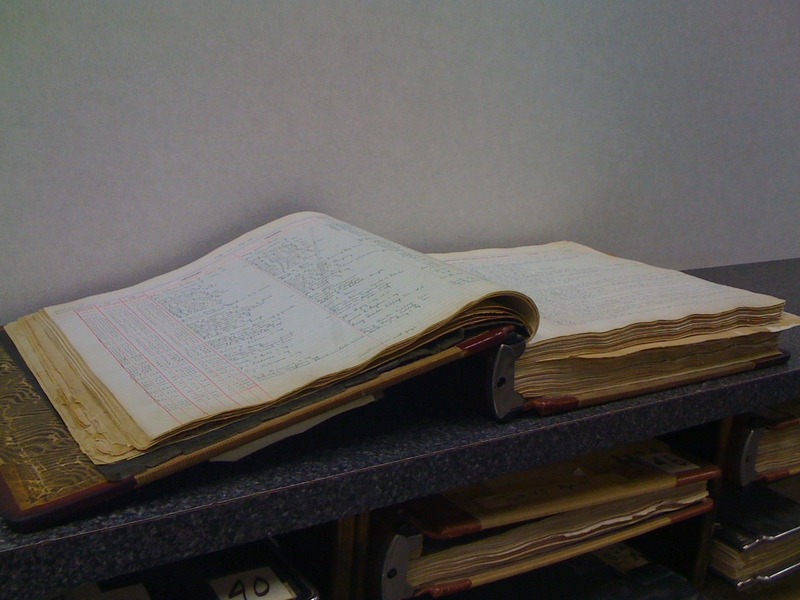 Sometimes the information in the registry books can give you enough information, but if you want the detail, you can note the book/page and type of document, and they can retrieve the original document from microfilm for $1.00 per page.